Wildfires are among nature’s most frightening and destructive forces — and they appear to be happening more frequently due to global climate change. Photo courtesy USWFS Wildfires are horrible to witness. A wall of fire hundreds of feet high can move with astonishing speed. and adjoining Michigan Department of Natural Resource lands. The problem isn’t limited to the United States. On February 7, 2009 — or “Black Saturday,” as it is now known — wildfires killed 173 people in the state of Victoria, Australia. It was the deadliest wildfire outbreak in Australia’s history. In the summer of 2010, wildfires associated with an unprecedented heat wave and drought in Russia sent a think haze over Moscow. The worst wildfire in the history of Israel occurred in early December 2010 when 42 people were killed near Haifa. And on May 15, 2011, within just a few hours nearly 40 percent of the town of Slave Lake in Alberta, Canada was destroyed by a wildfire. Total losses exceeded $1 billion; it was the second greatest natural disaster to ever affect Canada. High intensity crown fires have even burned in the Himalayan National Park in Nepal for the first time. Wildfires are horrible to witness. A wall of fire hundreds of feet high can move with astonishing speed. A superheated, smoke-filled column of air over the fire can rise 50,000 feet into the atmosphere. Burning debris can fall from the sky miles ahead of the main fire, often igniting more fires and sometimes trapping the unwary. Massive fires can even generate their own weather. Updrafts and downdrafts from the fire can radically change the direction of spread. Fire whirls, small tornadoes filled with burning debris, can spin out and away from the main fire. Besides the fire itself, the smoke that is produced brings its own set of problems and dangers. Inhalation of smoke can cause severe health problems and even death. 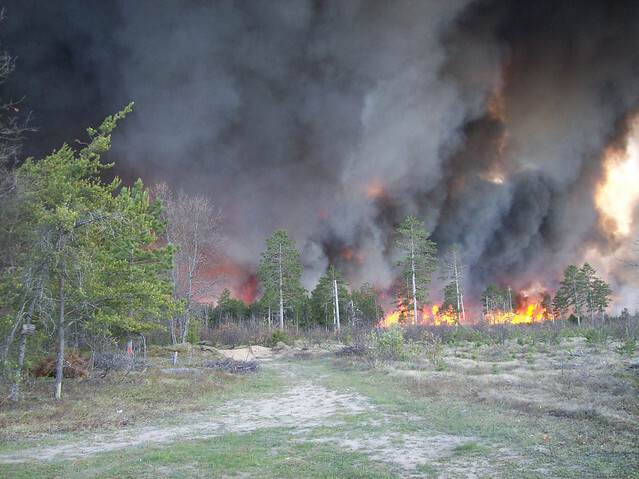 In the summer of 2010, a combination of smoke from numerous wildfires and excessive heat caused thousands of deaths in western Russia, according to health statistics. Reductions in visibility due to smoke are a major concern for transportation. Airports may have to close. Highways also may have to be shut down; horrible multi-car accidents have been caused by drivers being blinded by smoke obscuring a roadway. It is reasonable to assume that global warming is playing a role in the increase of major wildfires. A recent theory has linked increased temperatures in the high latitudes to a weaker jet stream. Besides being slower, the jet stream is also more prone for buckling into large waves called ridges and troughs. Drought will develop in regions that remain under an upper-level ridge for extended periods. 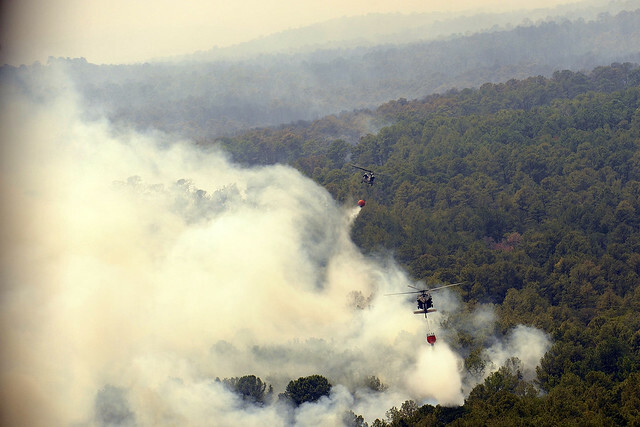 Drought sets the stage for wildfires. When the pattern changes and an upper-level trough moves in, it can bring with it strong low pressure areas and fronts. These systems can generate high winds, and with a lack of moisture no precipitation may fall. This is the ideal setup for an uncontrollable wildfire. There may also be a “feedback” mechanism involved here. Living vegetation converts carbon dioxide in the atmosphere into plant tissue. This reduces the CO2 level in the atmosphere. When this vegetation is burned, carbon dioxide is once again put back into the atmosphere, intensifying the warming effect. With no end in sight for the current warming trend, it is likely we will see an increase in wildfires and resultant casualties and damage. Directly or indirectly, wildfires are causing an increasing number of civilian casualties to go along with the deaths and injuries sustained by firefighters. When wildfires cross the interface into urban areas, then the destruction to property can be enormous. Losses can be in the billions of dollars. The threat won’t go away. Wildfires have been part of Earth’s natural processes for billions of years. With the exception of deserts and areas with permanent snow and ice cover, wherever there is continuous vegetation cover there are fires. Fires due to natural causes such as lightning are part of nature’s recycling process. Whatever vegetation is destroyed will grow back in time. Even when humans started to inhabit more and more of the previous pristine forests and grasslands, massive fires still occurred. People would even start the fires to replenish grassland ecosystems. As societies evolved and cities and farmlands replaced the natural setting, our view of fire changed. It was seen as a destructive force, a natural disaster we could stop. The science of fire fighting evolved and with advances in technology and equipment, fires could now be contained. We grew complacent in the belief that wildfires could be controlled and were not a threat to most of us. It seems we were wrong. Dr. Ed Brotak, a retired meteorology professor, is a freelance science writer. He is an expert on wildfires and wildfire weather.